I’m enchanted by “Morgan’s Tarot”. I had never heard of this deck before getting an email from U.S. Games Systems, but after seeing it first hand, I don’t know how I hadn’t heard about this before. 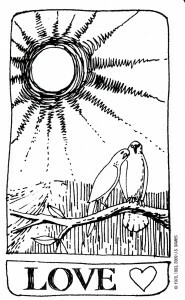 “Morgan’s Tarot” was originally published in 1970; created by Morgan Robbins and illustrated by Darshan Chorpash. It was republished again in 1983, and it has just been brought back again. Anyone who has seen this deck in any of its printings knows what I mean, once you see it, you can’t possibly forget. Morgan Robbins created a 1970’s counterculture/new age deck of cards. Despite being called “tarot”, the cards are not hippy reinventions of the traditional Major and Minor Arcana. Instead, they’re fun, thoughtful, and mind bending cards that force you to look within to find their true meaning. I suspect the format would be called an “oracle deck” these days, where you draw a card and reflect on it’s meaning. And yes, there will be reflection with this deck, it’s impossible to avoid. 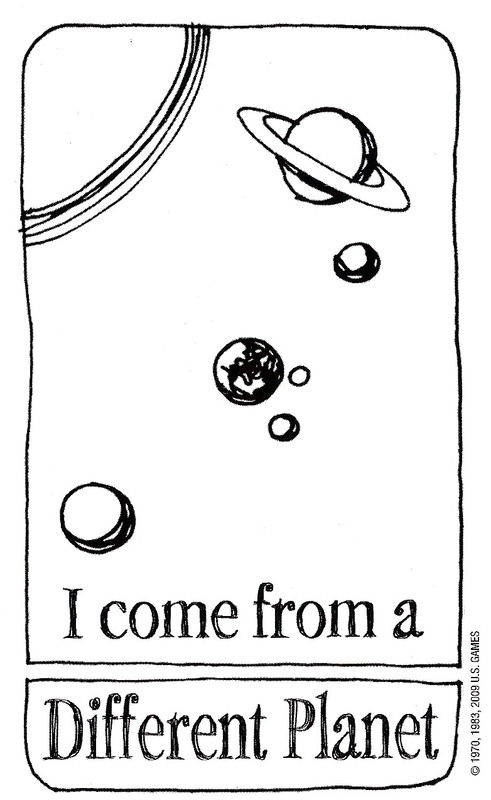 With cards that say things such as, “It is not what you do that counts, it is…where your head is at.”, “There is no you.”, or “I come from a different planet.”, there is nothing to do but look within for a meaning. Of course it does come with a little booklet that offers some ideas about the cards. However, even those require their own bit of personal interpretation. 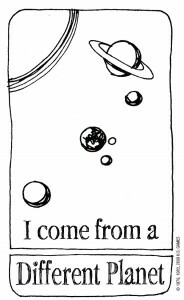 For example, the “I come from a different planet.” card has a blurb in the booklet that reads, “Psychologically, the card might express the individual’s feeling of alienation or separation from the environment.” But that’s straight forward you say to yourself. What on earth is Rebecca talking about? Well, the second part of it’s blurb goes on to say, “In reality, of course, having come from Arcantmycin, the sixteenth planet in the Wycloxian systems of Andromeda, you are having great difficulty acting like an earthling, especially since your memory was wiped out at birth and you don’t realize you’re an alien. Still, knowledge of your origin might enable you to adapt to the ways of the natives.” The 60’s must have been awesome! Speaking of the 60’s, a warning for you squares, you will find cards such as “Grass”, “Mushroom”, and “Drug Dragged” in this deck. The 60’s were awesome! The booklet does give you instructions on how to basically do a tarot spread with “Morgan’s Tarot”, and I’m sure that would be a good time, but what I really love is the second suggestion given for a use of the cards. “With two or more players, shuffle and deal an appropriate number of cards (five or seven are excellent numbers). The first player leads any card he chooses. The second player lays a card on top of the first, perhaps as an appropriate comment on this card. The play continues with the remainder of the cards. The object of the game is for everyone to win!” This does deserve another round of “The 70’s really were awesome!”, but I have to say in all honesty I thought this was rather clever. Certainly not for everyone’s taste, but I found it appealing. Very Zen after a fashion. I can’t let this review end without taking a moment to discuss the art by Darshan Chorpash. All the cards are done in black and white in a very freehand ink style. Imagine the most endearing, darling art images you can muster from the 1960’s, times it by two, and you’ll get the illustrations for this deck. The exact words I uttered, the moment I pulled the “Morgan’s Tarot” box out of the mailer envelope, after seeing the “Love” card on the back were, “Oh my God, that is so cute.” Not what my husband is used to hearing around the house he looked over at me, so I showed him the back of the box. Even he had to admit that it was charming. When it comes to tarot, I’m a bit of traditionalist, which is hysterical since I’m horribly ignorant about the meanings and symbolism found in tarot. Yet I remain oddly snobbish. That said, maybe that’s why I would call “Morgan’s Tarot” my favorite deck, after the obvious “Universal Waite Tarot” and the “Smith-Waite Tarot” decks. It’s an entirely different beast. It’s whimsical and fun, but also makes you ask yourself difficult questions like “Who am I”? Or harder still, “Tomato, Potato, Eggplant.” That’s it, the 60’s were awesome.